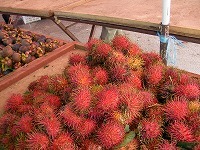 I'll introduce you delicious Malayian foods on this page. 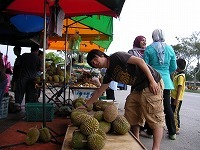 In Malaysia, they often held local market. 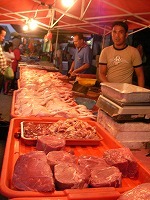 They are selling delicious fruits, block of meats and rare fishes which I've never seen in Japan. Moreover there were food shops and snack shops, so we can enjoy like a Japanese traditional summer festival. 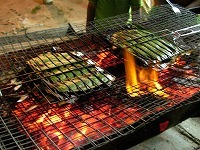 In the Pangkor island, we ate Ray on the banana leaf plate with barbecue for the dinner. 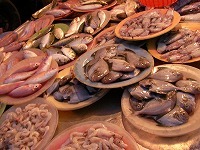 Banana leaf can absorb the smell of the fish, and taste was amazing! And drink was a coconut with just straw on it. Real coconut was little bit light sweet taste, and little bit warm. lol But this peculiar taste was addict me to can't stop drinking. 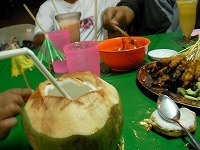 Moreover we can eat inside of coconuts with using spoon. That was nice too. 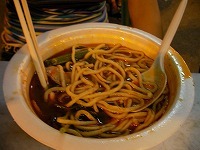 My girl friend, her sisters and me went to the famous Tomyam stall in the Ipoh city. 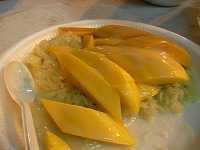 I ate it with sweet mango rice for reliefing hot taste. 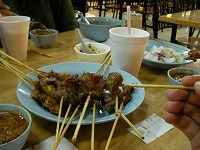 My most impressive food in Malaysia is Sate(Malaysian roast fowl). 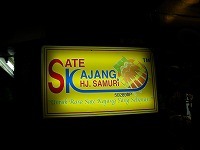 I've ate sate before in my university which my Malaysian friends made it, but real sate was amazing. I can't forget that when I eat once. I recommend you to eat sate, when you have any plan to visit Malaysia. And we also ate Nan in the restaurant near from my girl frend's house. 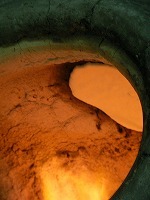 They paste the nan inside the clay pot and bakeing with high temperature. It was taste amazing when I ate it with curry. 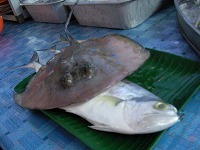 Nan is a India food but there is Roticanai in Malaysian food witch is resemble to the nan. The best way to eat this roticanai is to dip in the Indian darl curry.